Honda Racing India rider Rajiv Sethu put on a charging performance in the second race of the Asia Road Racing Championship season in Malaysia after an early crash left him at the bottom of the pack. Honda Racing India rider Rajiv Sethu got off a great start in the opening round of the 2019 Asia Road Racing Championship, setting a time inside the top 10 in practice. 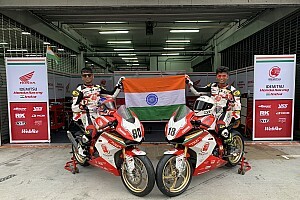 Honda India will field Rajiv Sethu and Senthil Kumar in the 2019 season of Asia Road Racing Championship. Honda Racing India rider Rajiv Sethu bagged a points finish in the final race of the 2018 Asia Road Racing Championship season in Thailand. Rajiv Sethu scored points for the Honda Racing India team in the final round of Asia Road Racing Championship in Thailand on Saturday. A three-rider contingent from Honda Racing India is in Thailand this weekend for the final round of the Asia Road Racing Championship. Asia Road Racing Championship has cited the addition of a new 1000cc class for excluding India from the series’ 2019 calendar. India has lost its place on the Asia Road Racing Championship calendar after three seasons, with Korea taking its spot on the 2019 schedule. Asia Road Racing Championship has added former Formula 1 venue Korea to its 2019 schedule, although the full calendar is yet to be announced. The Honda Racing India team scored a double top 10 finish in the Indonesia round of Asia Road Racing Championship, while the squad’s Indian riders also impressed with their charge up the grid. Several notable Indian drivers and riders will be racing around the world this weekend, including Jehan Daruvala, Aditya Patel and Kush Maini. Plus, fans of sportscar racing can tune into the Fuji WEC round. Former MotoGP rider Anthony West completed a perfect double in the India round of Asia Road Racing Championship with a dominant win in the second Supersport 600cc race on Sunday. The Honda Racing India team notched up another podium in the Chennai round of Asia Road Racing Championship on Sunday, but the ouftit’s local rider Rajiv Sethu narrowly missed out on a points finish. Former MotoGP rider Anthony West emerged on top in a thrilling battle with Honda Racing India's Taiga Honda to win the first Supersport race in the India round of Asia Road Racing Championship. Rajiv Sethu secured a points finish in the India round of Asia Road Racing Championship, while Taiga Hada brought more joy for Honda Racing India with a podium in his class. With MotoGP taking place in the Czech Republic and a round of Asia Road Racing Championship happening in India, this weekend has plenty to offer for fans of two-wheel motorsport. Some of the continent’s best riders will converge in Chennai this weekend for the fourth round of the Asia Road Racing Championship. Rajiv Sethu and Anish Shetty returned empty handed from the opening round of Asia Road Racing Championship in Buriram, Thailand.